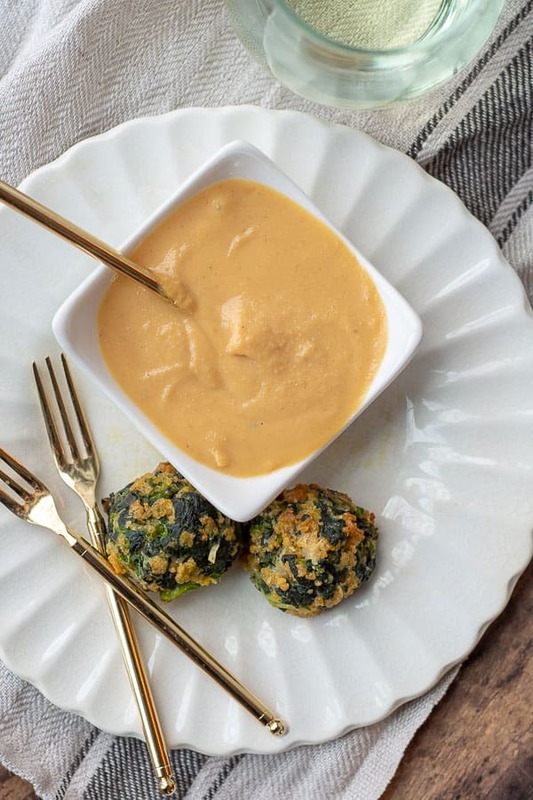 These Spinach Balls with spicy sweet mustard dipping sauce are guaranteed to go fast. 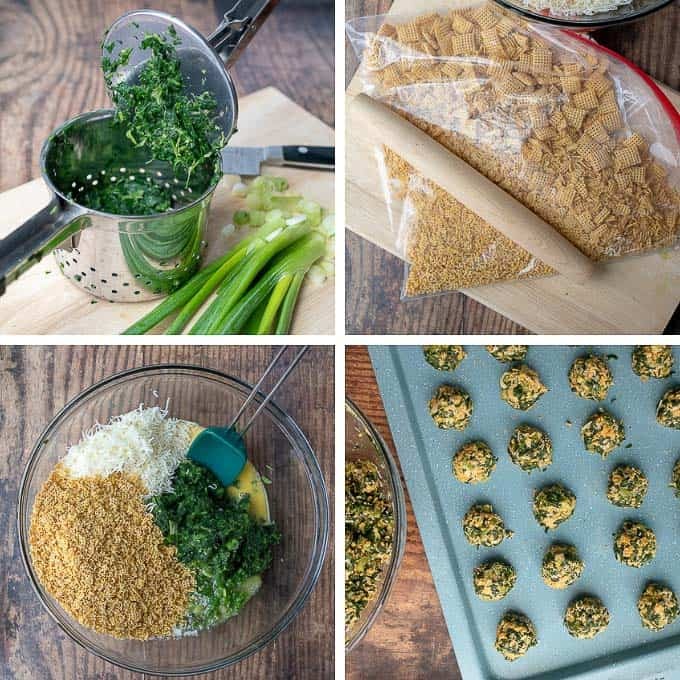 Learn how to make this easy, parmesan, herbed Spinach Ball recipe without having to use stuffing mix so they are naturally gluten free and spot on delicious! It has come to my understanding spinach balls are retro. Who knew? 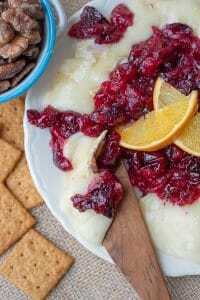 However, our family clings on to this holiday appetizer, outdated or not. Thanksgiving and Christmas wouldn’t be complete without these crispy, buttery, parmesan Spinach Balls. Perhaps we should entertain the idea of Spinach Balls making an appearance at other holidays. Then, maybe, wouldn’t have to all throw elbows to get to them? Can Spinach Balls Be Frozen? 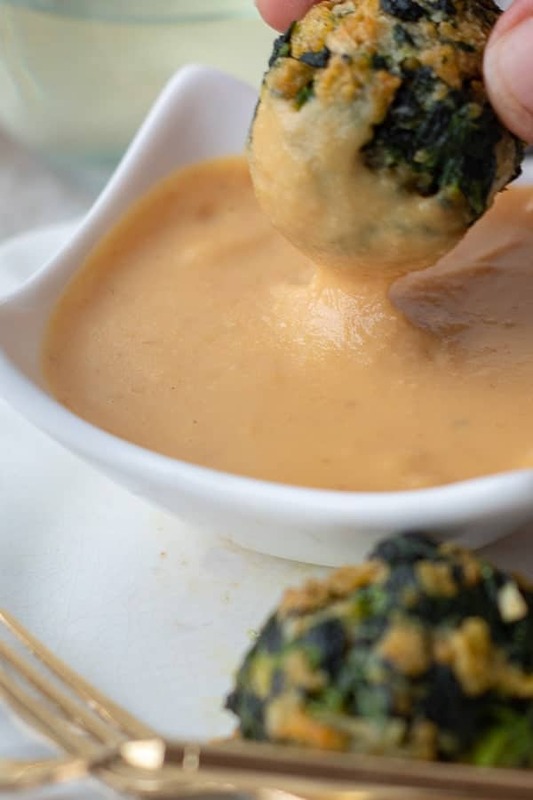 Spinach Balls and the spicy sweet dipping sauce are the perfect make-ahead party appetizer. Freeze the unbaked balls on a baking sheet, then transfer them to a ziplock freezer bag until you’re ready to bake and serve them. The mustard dipping sauce can also be made weeks ahead and stored in airtight container in the fridge. What Do You Dip Spinach Balls In? Much like my full circle experience with Ginger Molasses Cookies, the spicy sweet mustard dipping sauce wasn’t something I was always keen on as a child. Growing up, my sisters and I would dare each other to place the smallest drop of mustard on our tongues, claiming it burnt our nose hairs. 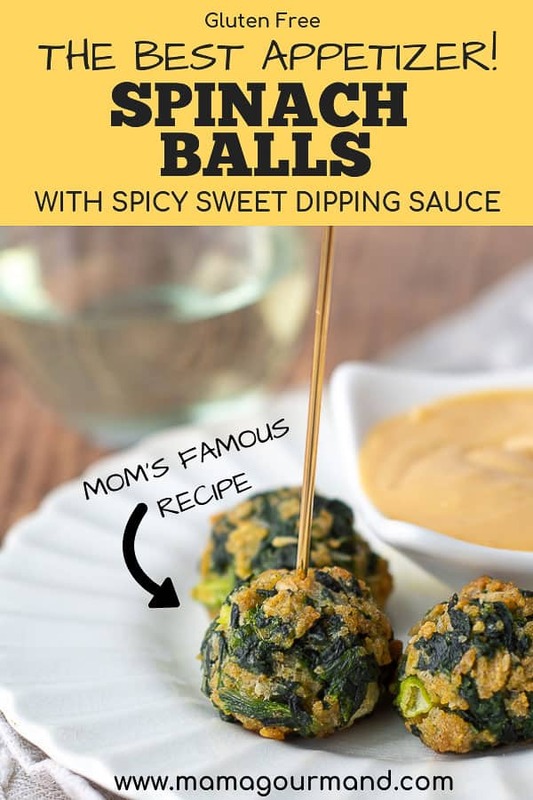 Maybe you just have to be mature (*cough, old) to get it because now I see the mustard dipping sauce as crucial to the spinach ball experience. It’s the ying to the spinach ball yang. Squeeze the chopped spinach dry. TIP: Using a potato ricer works perfectly for squeezing water from thawed chopped spinach. Crush the corn chex cereal in a plastic bag using a rolling pin or mallet. Mix together spinach balls ingredients. Portion out into 1 inch balls. Either bake immediately or place tray in freezer. Once the balls are frozen, transfer to a ziplock freezer bag. In a small saucepan place mustard / vinegar mixture, sugar, and egg. 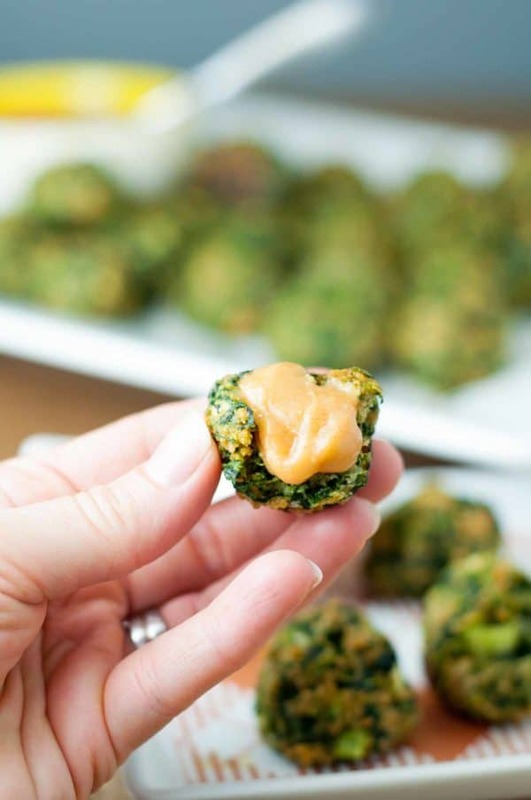 SAVE THIS SPINACH BALLS RECIPE TO YOUR PINTEREST BOARD! 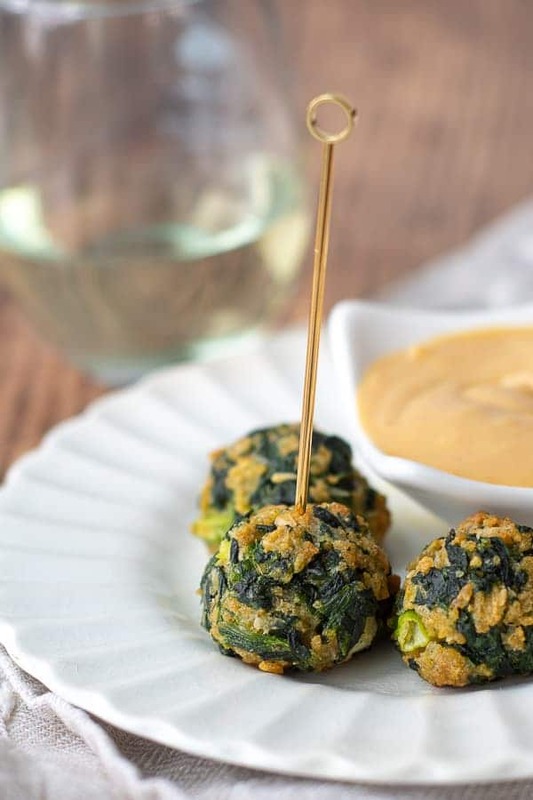 Easy, parmesan herbed Spinach Balls recipe with spicy sweet mustard dipping sauce doesn't use stuffing mix so they are gluten free and equally amazing! In a small bowl mix together dry mustard and vinegar. Let sit for at least 2 hours. This is crucial for developing the "heat" in the mustard. After a couple hours combine mustard mixture, egg, and sugar in a small saucepan over low heat. Cook, stirring constantly, until mustard is thickened, about 5-10 minutes. Set aside to cool. If using later, store in airtight container in refrigerator. Lightly beat eggs in a large bowl and then combine with the rest of the ingredients until well mixed. Roll into 1 inch balls and place on ungreased baking sheet. Bake for 15 minutes until golden and hot. If frozen, add about 10 minutes to time. Make Ahead Instructions: Mustard can be made ahead several days ahead of time and stored in refrigerator (I store it in a jar). Spinach balls can be rolled into balls and frozen UNBAKED on cookie sheet. After they are frozen, transfer them to a freezer bag until ready to bake. When ready to bake, place FROZEN spinach balls on cookie sheet, baking 10 minutes longer than instructions. I dream about this mustard! 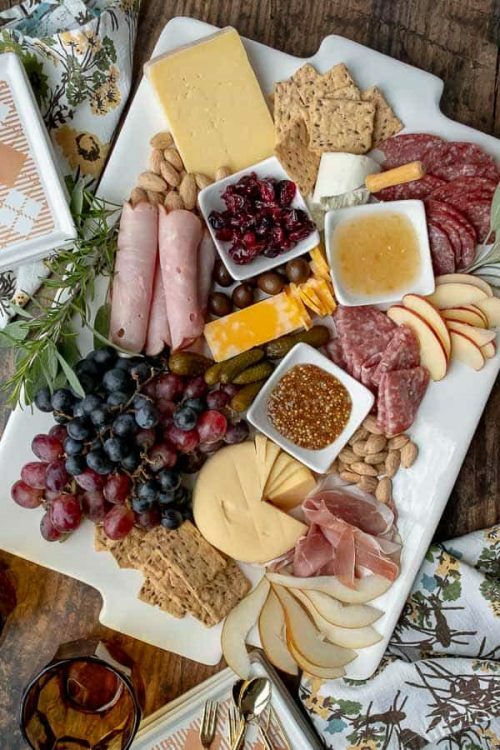 I made these again over the holidays and I unfortunately discovered using Coleman’s brand dry mustard is key 😒 It still tasted good, but the consistency was all off.